Im thrilled about this month’s Designer Spotlight, as it features one of my favorite designers to follow on Instagram. Seriously, if you don’t follow @houseofhoney yet, do yourself a favor and go click “follow” ASAP. I’ll wait. You might recognize her famous master bathroom which has been reposted to Instagram and pinned on Pinterest about a million times, justifiably. You’ll also see a photo of this stunning bathroom in the photos below. House of Honey is a Los Angeles and Montecito-based multi-disciplinary studio focused on residential and commercial interior design. Led by Creative Director, Tamara Honey, the firm is adept at translating clients’ goals and lifestyles into thoughtful and meaningful design. Combining intimate knowledge of the location, creative and construction process, they weave that story through all phases of the design process. I was able to meet Tamara at a party in Pasadena last year hosted by our mutual friend, Kristen Blazek of A 1000 X Better. Soon after our meeting, Tamara ordered a tapestry for her own home, which now hangs in her media room (You’ll see this piece in the photos below, too). I’m excited to share my chat with Tamara and more about her process and aesthetic in this month’s Designer Spotlight Series! Tell us a little bit about you and why you love designing interiors. My background was originally in Fashion and then turned to Interiors, which was a natural shift. I haven’t abandoned my love of fashion – color, pattern, fabrics, lighting as the jewelry in a space – those elements still inform and direct my designs. I love transforming spaces – especially historical or architecturally significant ones – to create an emotional connection with the end user. Inviting. Modern, yet whimsical. Soulful. Timeless. Fun - never being too serious. I love to use layers of textures and patterns, vintage and modern pieces to create fresh, yet timeless spaces. What recent design trends are you most excited about? I really try not to pay attention to trends. What I get most excited about is seeing great design or creative solutions I haven’t seen before, and of course being inspired by different cultural design when I travel. I also love to see great design in unexpected places – like outdoor spaces, airports or even bathrooms! What is your best advice for someone who is redecorating a room? It is so important to always pull inspiration from what inspires you and makes you feel good. Keep it fun and unexpected and a little cheeky! What rules do you live by when it comes to including art in your designs and spaces? Art is incredibly important to me personally and my designs. I live in a hub of incredible artists in LA and I love to involve them in my projects. The use of art can really bring life to a space, it has the ability to uplift and transport people within a room. Tell us about a past project that you used Lauren's art in? Media Room in Tamar’s own home, featuring a Canvas With Movement® tapestry. My favorite piece I have from Lauren is in my own home! It is the centerpiece in my media room and is so impactful to the space. I love seeing it every day. How does Lauren's Canvas with Movement fit into your design aesthetic? I try to create unexpected and original designs for all of my projects. And I believe that final layer–accessories, art, texture – provides the real soul to the space. Lauren’s single fiber strands that become her tapestry is such an unexpected twist on the original flat tapestry. That concept really marries well with my desire to tweak the expected and provide a new way of looking at design. I love that Lauren has started offering prints of her original tapestries and hope to use them in an upcoming hospitality project. Based out of Philadelphia, Barette Widell & Christina Boschetti are the duo design team of Widell + Boschetti, a boutique interior design firm that symbolizes how important a blend of disciplines can be to a successful project. 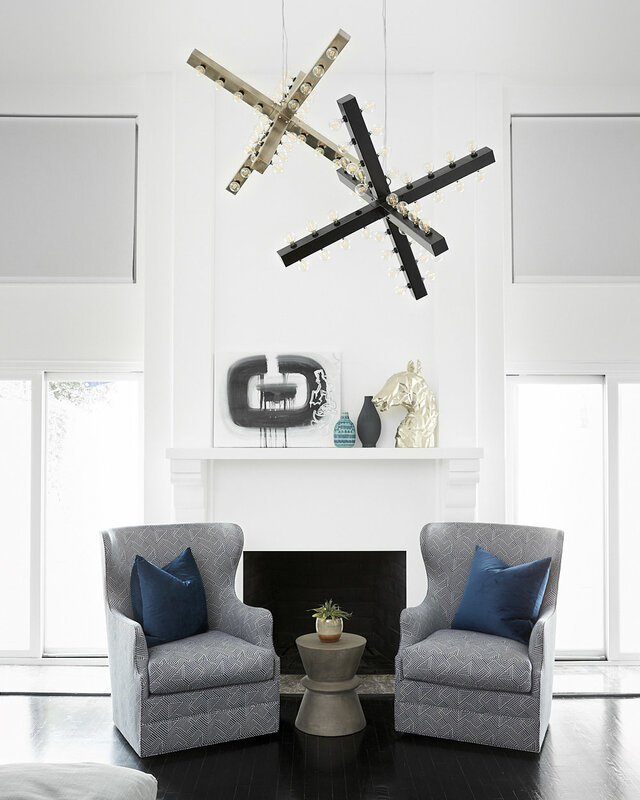 After working with the firm to create a custom piece for one of their projects, I knew I wanted to feature them in our Designer Spotlight series. Get to know this talented team and see more of the project which includes a custom Canvas With Movement® tapestry below! Tell us about Widell+Boschetti! How long have you been in business? Barette Widell and Christina Boschetti started their boutique residential interior design firm about 4 years ago. W + B has a technical designer (Cads,elevations, renderings, layouts) as well as an office manager (invoicing, tracking, bookkeeping, any admin). We call these girls our left and right hands. PHEW! How did you two meet? What lead you to designing interiors together? After their first run-in at the park, they both walked away thinking they have met their business partners. Quickly they realized their similar paths and common goals could be turned into something great. With both families on the verge of leaving Philadelphia fate kept them here to join forces. Little did they know their dream was right under their noses. Christina joined Barette to operate the lifestyle and event design company, called Widell Designs. After working their butts off for about a year both having kids in hand dragging them along to meetings, they decided the event business just wasn’t doing it for them. There was very little design and not enough money to deal with this business. Their love for design was to go to the next level. They soon took the risk of solely focusing on the interior design industry. They joined their names and officially became partners. Somehow, organically the event requests never came back. How would you describe Widell+Boschetti’s design aesthetic or signature style that differentiates you from other firms? Which celebrity is your ideal client based on their style or personality? What about their style or personality would be the best part of working with them? Charlize Theron. She is classic and sophisticated yet has a little bit of edge. Clearly, in her roles she isn’t afraid to take risks. Working with her would be a dream as she seems as if we could learn a lot from her through out the project. Which room is your favorite space to design? Why? Love love love designing formal living rooms! This is the space kids are usually not “allowed” heheheh! That said, clients are willing to spend more money on amazing quality product and give us the ability to take risks. Formal rooms usually are the jewel of the home which allows us to use luxurious lighting and elegant fabrics no matter what the aesthetic is. Tell us about your worst design fail and how you recovered and what you learned! Our biggest design fails started in the very beginning of our career where we tried to take on other trades like hanging draperies, etc. We had one client where we didn’t account for the change of depth of the new flooring and gave our seamstress the ceiling to floor existing draperies to make a pattern for the new ones. Even though, it was about a 1/2 “ difference the client was not happy. Needless to say we had to eat the cost of the draperies as well as not given permission to take photos of the entire project. What we learned? LET OUR SUBCONTRACTORS DO THEIR JOBS!!! What has been your career highlight? Signing on with an A-list celebrity hush hush- it’s a secret! He/She let us run wild with our designs and is loving everything about the outcome. Almost every piece of furniture was custom designed under our private label Widell + Boschetti which is also a turning point in our career! What rules do you live by when it comes to including art in your designs? There are no rules when it comes to art EXCEPT when our client is Art Enthusiast where you are not even allow to say the “A” word never mind placement. Art is such a personal thing to most clients so we include Art in all of our design boards first hand. We include art that we feel best suits the client’s aesthetic both by style and personality. If the client isn’t feeling the pieces we presented then we simply give it a couple rounds. If we do not come to fruition then we hand off the task to our client. How does Lauren’s artwork fit in to your design aesthetic? We love using Lauren’s art in our designs especially when the client has a bit of an edge and is a risk taker. Usually its that lonely bare wall that needs a significant piece to give dimension whilst not just a piece of framed art. We love that Lauren’s art has many different elements to it to not only make a huge statement but to really achieve the impact the space deserves. When choosing artwork or an artist to work with, what challenges do you face? How do you source artwork? Do you have a resource when it comes to looking for new artists or artwork? We have go- to trade companies we use for every day needs. We also do research through Instagram to find talented unknown or less known artists that speak to us and then usually build an insta love for each other which leads to presenting the artists work in our projects. Its truly an organic way to do business while building long lasting relationships. Top 2 tips/advice for designers, established or new to the biz? While designing, GO WITH YOUR GUT! The client may have an array of aesthetics they like. That said, they usually don’t know what they like! You as a designer need to really consider the bones of the home and pick which aesthetic will work best for them and then add YOUR own twist. Use Instagram as its the biggest free tool of marketing/researching/engagement. It truly allows people to see who you are as “real people” as well as REAL TIME designing and everyday life. Use this as an advantage as you can run with it as far as you want it to take you! What is the best way for us to follow your design projects and firm’s accomplishments?! I had to take a look through my old emails to remember when I first met Sherry Shirah. In March of 2016, Sherry sent me an email inquiring about a custom piece for her new home. Sherry knew exactly what she wanted and after a phone call to discuss her vision, I began working on a “medium” sized tapestry (these measure 72” across and hang 28” long). When I was finished, I sent her an approval photo. She loved it and asked me if I would be able to come and install the piece. I had never been asked to install my artwork for a client, but was excited for the opportunity to see the new home Sherry helped design, and also see my artwork hanging in a beautiful space. I wanted to make a good impression and bought a small tool box that I filled with hanging hardware, a level, a tape measure, a pencil and a few other things that made me feel prepared to “install my artwork”. Even though I’ve hung hundreds of tapestries on my own wall, there was a little pressure to hang my art on a brand new wall in a brand new home (while my client is watching!). But when I arrived, tool box and art in hand, Sherry welcomed me with the warmest smile and hug, and a tour of her gorgeous, single story, modern home. The decor was clean, with a balanced mix of vintage and modern touches and the feeling of artistic appreciation beginning with a baby grand piano in the foyer, the Annie Leibovitz SUMO book on it’s own tripod bookstand, a wall sized vintage map of Paris hanging opposite a glass, and a temperature controlled wine room. Remember, I’m still just in the entryway! Since meeting Sherry at her home in 2016, I’m lucky enough to call her a friend. Recently she made a career change, going from technology to interior design with the start of SLS Designs. In my opinion, she was born to design and now has two tapestries hanging in her home and has incorporated my coordinating velvet pillows in multiple projects. 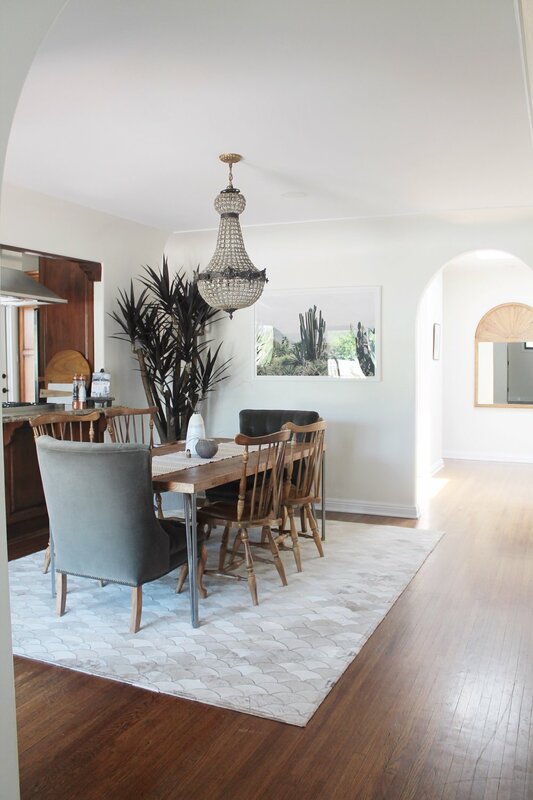 We are sharing images of all this below along with a little Q&A on how she makes it her mission to design spaces that you love to live in every day. 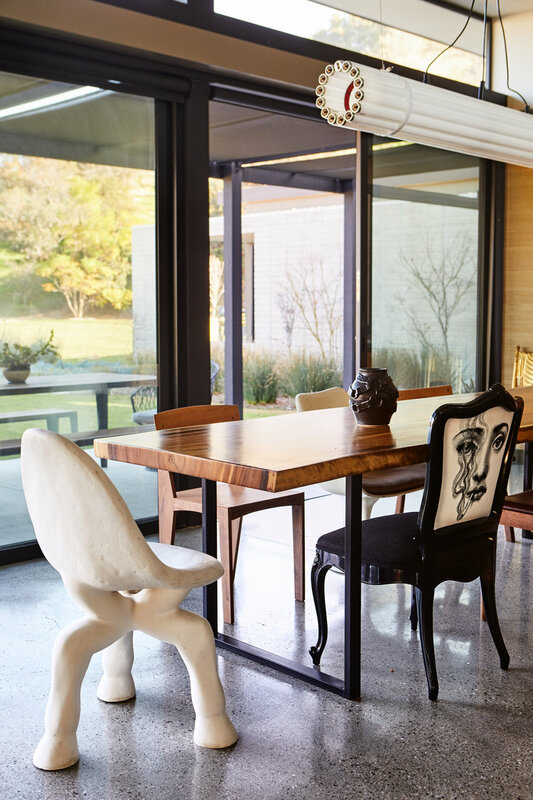 She specializes in residential interior design primarily in Dallas, TX and New Orleans, LA. I’m excited to share more about her business and design approach below! This may be one of the toughest questions to ask someone… haha. Can I be type A and a wanderlust soul at the same time? I’m originally from New Orleans so I naturally gravitate towards rich cultures, interesting spaces that have old character and delicious food! I live to travel but I find I love my time at home in Texas just as much. I have three dogs that I spoil whenever possible so that makes home one of the most special places on earth. ﻿How long have you been working in the design industry? The first tapestry I created for Sherry and installed in the guest room of her Texas home. It’s either passion, conviction or pure craziness but I started my interior styling business at the end of 2017 after deciding to leave the technology industry. Out of college, I worked at a prominent interior design firm in Atlanta for a few years. I innately loved design but my career took off in another direction when I decided to pursue tech. Through the years, I have used my own home as my blank canvas for constantly rearranging furniture, art and plants and I’ve always helped friends with theirs. Flash forward to the last few years, it was really weighing on me to pursue my dream of starting my own interiors business so I took the leap. I’ve loved every minute of building my own business and have been fortunate to work with many incredible people so far to help create a space that they love to live in every day. What advice do you have for someone with a passion for design and wants to take the leap and make a career out of it? It really is a leap to take that risk because it's embracing complete change and the unknown. I know the feeling first hand! But I think a second life career that centers around ones passion is such a gift to dive into. Know that you will have ups and downs - moments of brilliance and lows but maintain conviction and push through. Also, don't be afraid to make mistakes, it's going to happen because learning is part of the process but don't be afraid to own up to those mistakes. Also, find a couple of industry mentors/sponsors that you can bounce questions off of and gain insight. That has been invaluable for me. How do you begin the design process? I really start with two things: 1, walking through my clients’ space to understand the era of the home, how it flows and what pieces may already exist that could be instrumental towards driving the décor direction that we move towards and, 2, I have a personalized questionnaire that I asked my clients to complete. It helps me understand things like “which colors do you gravitate towards?”, “do you love plants?” and “where have lived throughout your life?”. This is really key as you approach the design tone of any home. When it comes to including art in your designs, what do you look for? Art is so subjective and I really try and to find unique pieces that my clients will love. I say to my clients that they really should love each piece of art they see in a room. It should invoke a special feeling. I find that including different textures are important to mix in a well curated room and that even applies to the walls. I gravitate towards unique photography, vintage oil paintings, sculptures/3D pieces and of course fiber art! Old and new world curation. Favorite color pallet for designs? What's your favorite room in the house? I really love my art studio/office. We have wall-to-wall bookshelves that are never alike week over week. I move books around, add new ones, hang new art and am constantly shuffling things based on my mood. I love the emergence of new independent artists that are leveraging Instagram to gain exposure. It allows me as a designer to gain access to unique artists all over the world. I’ve inquired and bought from artists from Australia to Toronto to Alabama! Start with a piece you love and want to see every day in that room and build around it. Remember that less can be extremely interesting when you have the right scale. How do you approach design challenges with clients and/or spaces? Every project comes with it’s own set of challenges, it’s just the nature of design. I think one of the biggest lessons you learn as a designer is that if you screw up or a piece isn’t to the clients liking (and I don’t know anyone that this hasn’t happened to) be humble and know when to take ownership. Challenges are all part of life. You’ll likely grow from the experience. What's your favorite place you've traveled to (or dream to one day)? France, for the opulence and Cambodia, for the soul of the people; both have such deep rooted history and you leave feeling so much love. Tell us about a past project that you used a piece from Lauren's ART and/or HOME collection. Which piece(s) did you include? I recently installed one of Lauren’s Spring 2018 tapestries into a home of a client that lives in a 1940’s tudor-style home on the M-streets in Dallas, TX. She has this magnificent room that we call the fancy lodge and the tapestry adds so much warmth and interest throughout the room. I also love having three of Lauren’s lush velvet pillows as rich accents in my small shotgun home, The Purple House, in New Orleans. Everyone comments on their beauty and durability and wants to know where I got them. You have included the velvet pillows in multiple design projects, what about them are you drawn to? 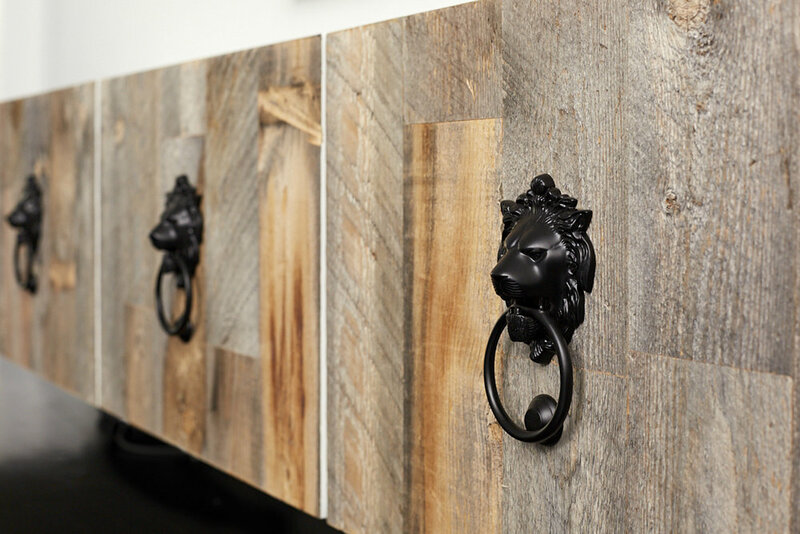 What surprised you most about this piece from Lauren's art and/or home collection? I continue to be in awe of the attention to detail that Lauren has. From the art itself, to the package and the handwritten notes. The authenticity carries throughout her process and her art from order to delivery. What's your website and Instagram so we can see more of your work? Mini Tapestries are the newest addition to the Lauren Williams® ART collection. Inspired by some of Lauren’s most favorite dye designs in her larger Canvas With Movement® fiber art, the Mini Tapestries are the perfect piece for your curated vignette. With just as much detail and depth as Lauren’s large scale artwork, the Mini Tapestries have been a project in the making for a long time. Each Mini measures 12” wide and varies in height. 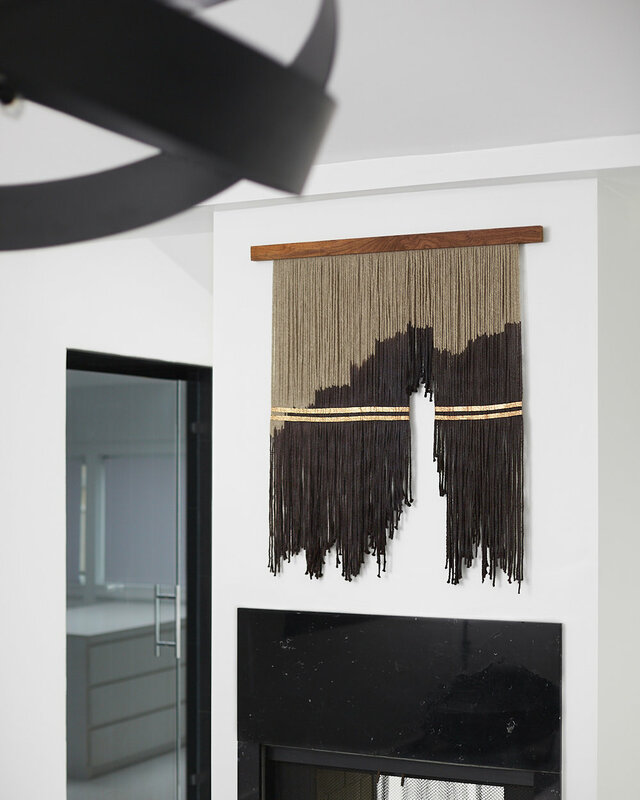 Lauren’s signature wool strands are suspended from a stunning piece of walnut wood and come with the hanging hardware for an easy installation. Metallic detail has been meticulously added to select pieces and some designs were created to be perfectly paired, while others are ready to stand alone. UPDATE! Within 24 hours, the collection of Mini Tapestries sold out! Thank you to everyone who included a “Mini” in their space! Thank you to those who have emailed us for more information regarding the next round of Mini’s. A new collection of Canvas With Movement® tapestries will be available at the beginning of November and the next collection of Mini Tapestries will be available shortly after, in December. Parachute x Lauren Williams Art Collaboration! I like to think of my tapestries as a canvas but with movement. I suspend hundreds of individual wool strands and use dyes and paints to create different designs. From the way the fibers hang to the amount of dye each strand decides to absorb, my art has a mind of its own. I always start with a vision, but as I work, the direction changes based on the fiber’s reaction to the paints and dyes. Each piece is different no matter how much I would like to replicate a previous tapestry. I would describe my work as a bold statement piece, but with an organic and peaceful approach. Modern Bohemian is artistic and free spirited with a contemporary feel that can be seen in my Canvas With Movement fiber art. I love the texture and organic composition of fiber art but wanted to bring a modern aspect into the picture. By incorporating a linear piece of walnut wood to create a wool canvas, I can use paint and dye to add bold and unique designs, to my non-traditional form of fiber art. What makes the Parachute x Lauren Williams quilts unique? How are they different? This was my first foray into bedding, and specifically quilts. I knew I wanted to use my fiber art as inspiration and create something really dynamic and unique. I created two color schemes with the design—Dusk and Dawn—to represent the duality of light and darkness; beginning your day and ending your day in bed. The quilts can go up on the wall and totally transform a space, but then you can take it down and throw it on the bed and interact with it on a daily basis—it’s truly artwork for your bed. How did the Parachute x Lauren Williams collaboration come together? How did you approach the design process? I have loved creating pieces for walls around the world, but my favorite part of creating is seeing the immediate desire from people to touch and feel the art. This inspired the vision of transcending the art into a more tangible product, off the wall. The texture of linen was the first thing I was drawn to when looking to explore my tapestry designs on a quilt. Parachute uses such beautiful linen in their products and so a collaboration to create a form of art that people could wrap themselves up in, was a natural fit. I pulled some of my most favorite tapestry designs and sketched them into a quilt design. The fluidity of my designs needed to be adjusted to form the quilt. Taking my three-dimensional art on to a 2-dimensional paper design, and then to a linen quilt was a challenge but it is really cool that Parachute had the vision to see my fiber art designs utilized in a bedding product. Various designs were presented in the discussions with Parachute, but we landed on a piece that had sharp angles in the dye design and I loved how it came together in our modern, geometric quilt. Where do you source your inspiration? I love blank walls and when I see them I immediately begin to envision what the perfect piece of art would look like to complement the space. I use blank walls to inspire ideas for new work. Nature is also a huge inspiration for color combinations. I love playing with color and choosing color combinations that are unexpected but still natural. Tell us about your relationship with your art? My form of art demands cooperation. Although I start with a vision, the fibers have a mind of their own. I can fight it, or I can cooperate. The more freedom I give each tapestry to come alive, the more beautiful the result is. I love the process of letting go and watching something beautiful develop in my hands. How did you end up running your own successful full-time business? You began your career in LA and are now in Dallas. How do the two places influence your work? The creativity and inspiration I feel from the west coast is powerful. The sunshine, colors of the water, sky and foliage in LA feeds my soul. Our trips to visit family and friends in Malibu are like a dose of “creative vitamins” for me. Dallas has provided me the opportunity to work from home and be with my family while creating art. Both cities hold dear places in my heart. What advice can you give to budding entrepreneurs? Don’t quit your day job. Yet. It takes time to work through creative concepts and passionate ideas. As soon as you turn it into a “job” and base your income on it, you walk the line of suffocating the creativity and passion. You have to be true to yourself and your art. Don’t make what other people want you to make. Make what you need to create. People respond to passion, authenticity and originality. Don’t lose that. Click here to check out ‘Dusk’ and ‘Dawn’ quilts in the shop. I hope you love them as much as I loved creating them! Hi there! I’m James and I’m the other half of Lauren Williams® Art. I run the day to day business operations, including vendor relations, accounting, special contracts, project collaborations, invoicing and payroll, as well as being the liaison with designers and art advisors on commissioned works. I also handle the video content you see on YouTube, Instagram and the website. I manage the transportation and freight for Lauren’s large-scale works, and overseas shipments, too. There are a hundred other things that Lauren and I juggle to run the business, but these are the main things that I take care of so that Lauren can really be focused on creating. I hear it all the time from guys who say that they could never work with their wife and I understand where that comes from, but I wouldn’t have it any other way. This is the third business that we have built and run together, not counting our family of 5, with 3 boys we created and raise together! I think it’s very special for our boys to see us working together and building something using our talents. Working to support a family takes a lot of time, so why not spend that time with the one you love, if you have the opportunity? I think it’s important however to do something you both love. It can’t be something only one loves and the other likes. You both need to be committed to it and feel equally invested so that you respect and treat each other as equals. I don’t believe in a “work/life balance” when it is your own business. We live and breathe the business and all that it takes to keep it running. It is a 24 hours a day, 7 days a week thing. Being intentional about time to focus on each other is crucial though. That and a lot of prayer! It can be challenging, at times to be married to an artist. Lauren is very creative and often has a thousand things running through her head related to new projects, current projects, upcoming commissions, ideas for a new pieces and business to-do’s, on top of being a mom. Respecting her way of processing while also reminding her to take a break and look at what is going on around us, can be difficult. I think my past experience truly prepared me to be the perfect partner for Lauren. I’m from the East Coast by way of Santa Fe, NM. I lived in Santa Fe during my teenage years and was constantly surrounded by art. I attended a small private school, with only 27 people in my graduating class. We had an entire building that was dedicated to art classes. We studied everything from pottery to painting and photography. I was surrounded by friends who were amazing artists and witnessed them create, and what the creative process for an artist looks like, including excitement and frustration to doubt and creative blocks. One of my best friend’s father was an art dealer and opened my eyes to the business side of the art world. I watched him trade a painting for a home once! Mind was blown! The homes I hung out in had original works by artists like Georgia O’Keefe and Picasso, I even helped install a George Rickey sculpture. This lifestyle shaped my love for all things art. I became enamored by the art business and I wanted to be an art dealer. I continued my education at the University of New Mexico and studied art history. After a couple of years sitting in classrooms looking at art, I decided to mix it up and move to Los Angeles. After a year or so of “discovering” myself I landed a PA job on a movie set and instantly fell in love with this process. Being paid to watch and observe people making art, this time in a collaborative way I hadn’t seen before, was life changing for me. I worked my way up the production ladder, from getting coffee to working as an assistant for the late Mike Nichols on the movie “Angels in America”. I produced TV series for Mark Burnett, on shows like “The Apprentice”. Later I began executive producing commercials with advertising agencies and eventually landed as the VP of Production at a studio in LA. I have also worked as a Director on various projects throughout my career. I think to be in film and television you have to love to create and be willing to help others create. As a producer, I learned what it meant to support and work with directors to bring their vision to life and especially how important the director-producer relationship is. There needs to be complete trust to benefit the process. As a director, I value the input of others and thrive on the collaboration with a DP, producer or costume designer. Ultimately It’s all about people working together to bring a vision to life. Through my art-filled childhood and my career as a Producer/Director, I have learned that artists struggle, whether an actor, musician or painter. Artists are their toughest critics. I’ve learned to allow them to work through their own process and know when to help and when to let them work through it on their own. When Lauren decides to take on a commission, I have to prepare her for the creative journey in order to complete the piece. From excitement, to frustration and doubt, to exhaustion and impatience and finally acceptance and pride, the emotions that Lauren goes through as an artist are high. It can easily affect the business and our relationship if we aren’t prepared spiritually and emotionally. There are times when I see she is creatively frustrated and needs to walk away from a piece for a few days. I encourage her to get a manicure or spend time with our boys. One time she was so discouraged with a giant commission with a tight timeline, that she told me she was quitting and that I needed to finish it for her! I took that as the cue to start making her favorite watermelon margarita and call it a day. Working together as a couple is an incredible opportunity, but it certainly comes with its challenges. I think the business has actually strengthened our relationship because it forces us to communicate and listen, even when we don’t want to. I couldn’t have been given a better partner to be married to or be the mother to our three boys. God had us planned for each other. On a lighter side it also means our house is constantly rotating furniture and art on the walls, so I feel as though I am living in a working gallery. Seems as though things have come full circle, right? We loved creating the video for Paige and are so excited to have some beautiful moments of our life documented in their short film. Thank you to Paige for including us in this project! Thank you to our friend, Brandon Zebell for his talents in filming and editing. Thank you also to photographer Dave Puente for the awesome images. Audrey is a native Texan living in Los Angeles with her husband Matt, their 2 year old son, Huxley, and their dog, Shadow. They're expecting a little girl in September, which everyone is really excited about! Audrey studied advertising at the University of Texas in Austin and worked in the ad industry for 10 years before leaving to spend more time at home earlier this year. She has always been passionate about home decor and has been selling vintage decor online for several years. 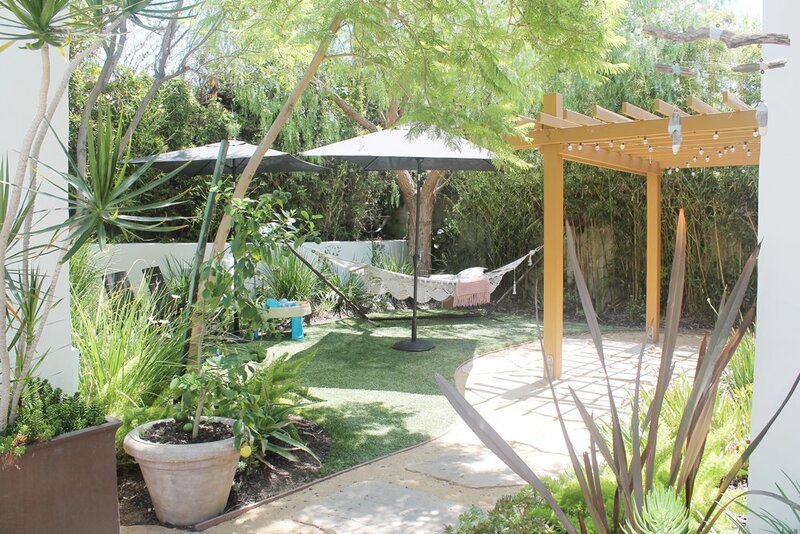 Audrey is currently helping a few friends design their homes here in L.A., which she has found to be rewarding and fun! I got the chance to chat with Audrey and wanted to feature her beautiful home for my Client Spotlight series. Where do you live? Tell us about your city! I was born and raised in a very small farming town in south Texas before moving to Austin for college. Once I graduated, I was yearning for an even bigger city. I moved to Los Angeles 10 years ago, and I still really love it here. Looking back, I am so glad that I had the guts to pick up and move across the country on my own at age 23. I have developed a deep appreciation for everything that a big city has to offer, and although I loved growing-up in a small town, I am excited to raise my children in a sprawling city! How would you describe your style & aesthetic? My style is always changing which makes interiors so much fun for me! I love to discover a new artist or vendor that I can support by incorporating their work into my home. 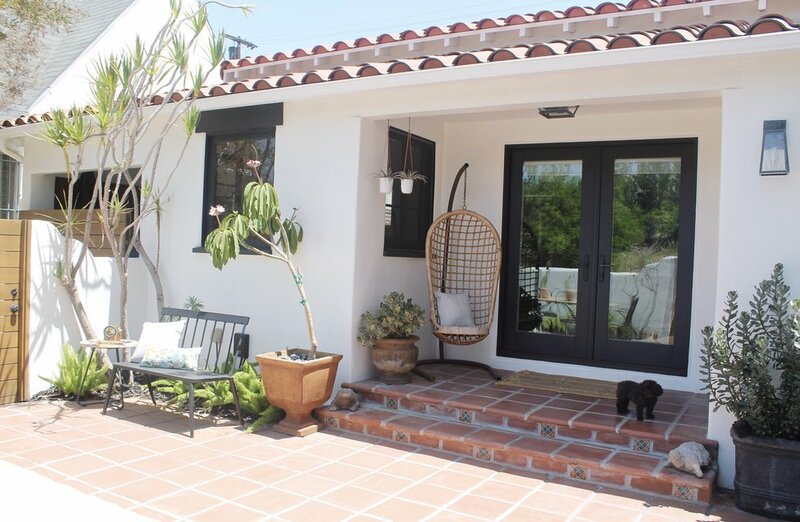 Three years ago, we purchased a Spanish style home that was built in 1925. Since then, my style has mostly been focused on honoring the heritage of the home. If I had to pick one style, my favorite would definitely be bohemian. I have incorporated bits of boho design into spaces throughout our house, and I am having a lot of fun doing the same with the nursery for our daughter! How did you first discover Lauren’s art? I discovered Lauren on Instagram, and I think I had an email out to her within the hour. I had been craving something different above our sofa in the living room, and I knew immediately that I wanted one of her tapestries to fill the space. How did you utilize them in your space? The tapestry is the focal point of our living room. It hangs above our sofa and is the first thing you see when you walk into our home. I love that it's different and that it moves! It brings so much life to our space, and it is the most complimented piece in our home. What surprised you about your new art piece? When I first commissioned Lauren to create the tapestry for us, we agreed on a 36" circle. We worked together o finalize the dye colors, and I was so excited to finally get it on our wall. As soon as I hung it, I sent Lauren a picture. She replied saying, "I love it... I just wish it was bigger!" I agreed, and she quickly sent me a 45" circle to replace it. The 45" tapestry is huge and fills the space in a way that makes the room feel even larger than it is. Any future home projects you have in mind? I am currently finalizing a nursery for our daughter, which has been a really fun project for me. I grew-up with three brothers and thought for sure that our second child would be another boy. I knew exactly what I was going to do with his nursery, and I was thrown for a loop when the doctor called to tell us that it's a girl. For her nursery, I've stuck to one rule: I am only filling it with things that I love. There's no color pallet, no specific style... just things that bring me joy! Carly Kuhn aka The Cartorialist is an amazingly talented artist from Los Angeles who recently purchased the "Shades of Blue" Tapestry (size medium 72" across and hangs approximately 28" long). Carly and I met on Instagram a couple years ago and got together last summer while I was in LA for work. We hung out at her apartment and chatted all things art, Instagram business and life. When she redecorated her bedroom a few months ago, she called me about a tapestry and we both knew she needed the "Shades of Blue" piece hanging in her home. I hope to have one of her beautiful pieces hanging in my own home very soon! She is a gem and I truly enjoy her art and design aesthetic. I am an artist, born and raised New Yorker - and my past life I worked in television comedy! How would you describe your style/aesthetic? My style is very airy, open, with lots of natural light and a neutral color palette. The space is a blend of Californian, with hints of mid-century modern and Scandinavian. What drew you to the "Shades of Blue" Tapestry? I tend to have a lot of neutrals in my space- whites, beige, wood - but wanted to bring in color. The blues of the piece brought that color to my bedroom in an organic way. Also, blues are very calming to my eye and that felt very fitting for the bedroom! How did you utilize it in your room? Were you happy with how it turned out? After weeks of cutting, dyeing and suspending wool strands from walnut wood to create my Canvas With Movement® tapestries, I spent a couple days photographing each piece to present them to you, my collectors. “Photo shoot day” as I like to call it, is one of my favorite parts of the process in preparing a new collection. It allows me to look back on what I was thinking and how I was feeling as I created the collective. This month, I see a theme conveyed through my art and I wonder if you will see it too. Oftentimes, we overthink what and how inspiration arrives. As an artist, I am guilty of this trap. This collection however, I simply allowed my hands to take over and gave my mind a break. It is 100 degrees in the studio right now, and so I focused on survival. Not to be dramatic, but even with portable air conditioning units pumping in the studio, we are lucky if we feel air below 95 degrees during the month of July. That creates opportunity for heat exhaustion and dehydration, if we aren’t careful. I’m blessed to be surrounded by a team of hardworking, flexible and supportive people who never complain about the heat and smile when I propose an ice cold Topo Chico break after lunch. Together, we are making the best out of our 100-degree garage studio and with such positive attitudes, I believe we are launching the greatest collection of work so far. With this month’s mentality of embracing the heat and allowing my hands to work without expectations, I saw the art create itself. I literally could not force anything in this collection. Due to the extreme temperatures, I needed to relax, allow the summer heat to invade my mind and then freestyle without restrictions. I had to trust creative instincts and let the process take over without dictating or controlling the art. This month, the art came alive without me forcing any pre-planned designs. The theme I saw on “Photo Shoot Day” after photographing the collection was that by allowing the process to be the inspiration and enjoying that more than the product, I was able to allow each Canvas With Movement® piece come alive on its own. This art in this month’s collection is full of freedom, exploration and positivity. Without force or control, the pieces in my July Collection have come together among the heat of the summer and I cannot wait for you take a look and see how I embraced the elements and allowed my creative instincts to take over. Lara Cerreta recently purchased the "Ascension" Canvas With Movement® tapestry and shared the photos with us! I love her styling and wanted to share a little bit about Lara and some photos of her beautiful family and home. Lara is is a mother of two boys, and has been an elementary school teacher for 15 years. She has been recently enjoying the process of transforming four of her own homes for pleasure and profit and loves the challenge that comes with renovating and designing serene spaces. She's currently working on a new Mid Century Modern home in the hills of Encino, CA. Lara's style is a mix of Mid Century clean lines layered with Scandinavian and 70's glam. It was the blues and gold coloring that first caught her eye with the "Ascension" tapestry and has it hanging in the dining room although she admits she's probably going to move it around because of how versatile it is! Thank you, Lara for including my art in your home! Welcome to the first of our ongoing Designer Spotlight Series! I love meeting and working with designers and art consultants to help incorporate the perfect piece of art for their design project and am excited to help share their stories and advice with you! Beachy Boheme is an Encinitas-based home décor and design boutique offering interior design services and an eclectic mix of new, handmade, vintage and unique home furnishings and accessories with a relaxed bohemian vibe. Designer and curator, Hanin Smith is passionate about helping create spaces that foster love and positive energy. Tell us a little bit about you and why you love designing interiors! My love for designing interiors started when I was young. When my family immigrated from Jordan, I was 8 years old and struggled to feel like I belonged in southern California. With home as my refuge, I turned to decorating to carve out my own space. I would always rearrange my own room as a kid, borrowing my mother’s Palestinian embroidered textiles and combining them with tie-dyed fabrics to create a space that felt like me… part Arab part American. Eventually I’d decorate larger spaces in our house (usually right before my parents were hosting a big party! ), but I never pursued this as a career. My Middle Eastern parents preferred I pursue more traditional education and reserve arts/creativity/design as a hobby. So, I have spent most of my adult life hopping around different jobs in TV, journalism, marketing, PR, technology and HR wondering why nothing ever clicked. It wasn’t until I got laid off while I was 6 months pregnant with my son Reid (now 2) that it all started to make sense. Armed with a small severance and lots of free time (aka unemployment), I got to fulfill my need to nest by decorating the crap out of my own house… and found my calling! Of course, I had major self-doubt since I don’t have a design degree, so I tip-toed into the design world by opening an online store selling home goods (pillows, planters, small furnishings, etc.). Through staging my home goods on social media, people started asking for design services and I took my first paying client. It dawned on me then, that cultivating a true sense of home isn’t a feeling unique to immigrants, but rather one that is shared by all. I use this realization to help design my clients’ homes in a personal way that reflects who they are, rather than what they see on social media alone. To me, home is a feeling of true belonging, a safe place where you can “turn off” and be you. Usually my inspiration comes from my clients’ lives… where they are from, what they love to do, etc. and I try to find a way to infuse their home with elements that draw on their own histories. Etsy is a mecca of solutions, and social media has introduced me to makers and artists who have amazing unique pieces. That’s how I came to learn about Lauren's artwork through Instagram. I’m so early in my career that I have yet to hone a specific design aesthetic of my own, but I am influenced by the SoCal lifestyle. Being close to the beach, with young kids and almost year-round sunshine, I gravitate towards bright and airy spaces with an eclectic mix of textures and patterns. As much as I tend to love variety and eclectic decor, I also love the minimalist Shaker trend. I think it’s so cozy and am drawn to places that feel nostalgic (who isn’t)! It reminds me of the Little House on the Prairie but IRL. What’s your favorite room in the house? Normally I would’ve said the family room, but right now we’re in the middle of a major renovation, and I’m realizing I prefer the master bedroom. 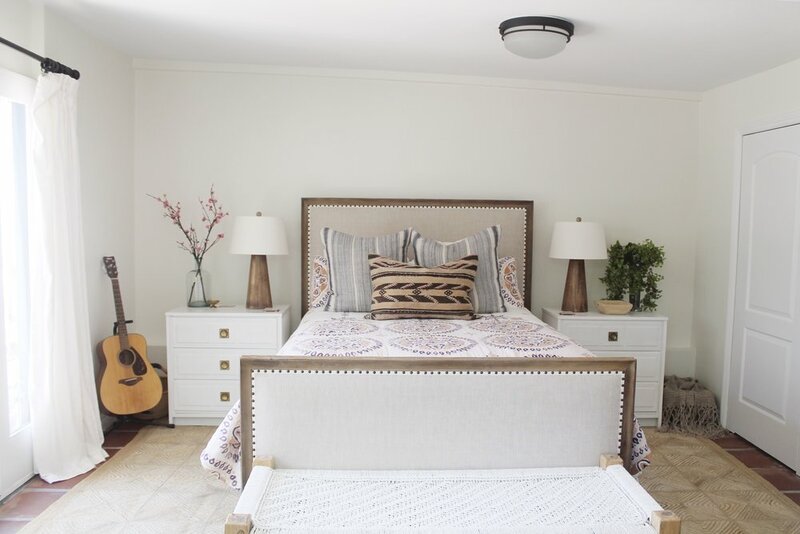 Because I have little kids, the master bedroom is less of a “romantic” space and more of a family space… the kids barge in and we have some of my favorite family moments wrestling or reading on the bed, uninterrupted by a TV, so we share a lot of quality time there. That’s my favorite space for now, and since it’s highly personal and non-formulaic on the design side, it’s fun to decorate. I wish I could take my own advice, but it would be this: turn to social media for initial inspiration and then turn it off! It’s so easy to get overwhelmed by new trends and second-guessing yourself, but really is the best advice to shut off the other design voices, and listen to what makes you happy, what feelings you want to have when you walk in to a space. Start there, and try to ignore the noise. Second piece of advice is to pay attention to scale… no matter how pretty your furnishings are, if they are out of proportion to the space, it will always feel a little awkward. In this case, it can’t hurt to hire a designer to help guide you (shameless plug). Art is highly subjective and personal, so I listen to what emotions my clients want to evoke in a space, and use that to inform the decisions I make about art. Art is also an investment, and a good one. I prefer one large statement piece to a dozen pieces, but there’s a place for both. Tell us about a past project that you used Lauren’s art in? One of my best friends asked me to decorate a guest room and gave me carte blanche to do whatever I wanted (with very few requirements). The room has 10 foot ceilings, so it can feel cold or hollow and I knew we needed to drench the space with textures to absorb the sound and give it warmth. I was so excited to use Lauren William’s artwork… not only for the visual effect, but for the texture. When the piece arrived, it looked even better in person because the weight of the wool and the quality of the wood can only really be appreciated in person. It’s still one of my favorite spaces that I’ve designed, and get lots of compliments on the art in that room, especially that piece. How does Lauren’s Canvas with Movement fit into your design aesthetic? The warmth of Lauren William’s canvas with movement art is what draws me to it, along with its refined simplicity, and quality materials. It’s a rich piece of art that elevates a space and really adds warmth to the overall vibe of the room. I hope to get to use more of it in future projects! How does it feel to be included in Lonny's top 18 incredibly cool companies run by young moms? Incredibly cool! Click here to see the full list. Each month I release new Canvas With Movement® artwork and this month is an exciting collection of pieces that I cannot wait for you to view! I have developed a new design of tapestries called the “Long Circle” built with my signature Canvas With Movement® yarn in a gray color palette. A blend of wool from both black and white sheep, the gray strands are not dyed, but carefully spun in a perfected proportion, resulting in naturally created gray fibers. The gray strands are suspended from a circular frame in a “perfectly imperfect” form of round fiber art. Almost 5 years ago when I created my first tapestry, I had the vision of building a canvas but with movement. Although a self-taught painter, I wanted to create a design on my Canvas With Movement® tapestry, and dye seemed to be the best medium. I temporarily abandoned my paints and have spent many years perfecting my dye techniques. I love the fluidity of dye paired with the movement from hundreds of wool strands. My art has taught me to “go with the flow” and release control of my intended design allowing each piece to come alive with the freedom to move. As a new style of tapestry formed in the “Long Circle” design, I had the urge to come back to my roots as a painter and push the boundaries of fiber art by actually addressing my tapestry as a canvas and painting it. You will see in the Long Circle pieces my approach to painting a Canvas With Movement® tapestry. The first Long Circle design expresses my passion for movement and motion in my artwork. Although the painted strands are held in place by two metallic lines, I wanted to convey movement through the painted layers in the design. I incorporated a Jackson Pollock style on the last two of the pieces, which felt very appropriate as Pollock’s works, which came to be known as “drip paintings,” present less a picture than a record of the fluid properties of paint itself. “Movement” is my inspiration in all my works, and my “Canvas With Movement” fiber art was born because I wanted to create art that had physical movement. Everything that I create includes some expression of movement and I became fixated on how Jackson Pollock’s art was referred to as “action painting” because of the way he created his pieces. This felt very personal as each of my pieces require massive amounts of physicality to create. From cutting the individual strands, to the building of the 6 foot, often times larger, fiber canvases, there is much labor that goes into creating the base of my pieces before I even approach dyeing or painting my designs. Beyond the Long Circle designs, there are many pieces that range in style, color and shape. I hope you can feel the movement and passion that goes in to each Canvas With Movement® tapestry. This month offers a collection that I am proud to share with you! Thank you for your interest and support! I absolutely love to meet and hear about my client's and how they utilize my work in their homes. Cheyenne recently purchased the "Zen" tapestry (size small, 36" across, hangs 48" long) to compliment their nursery project and I thought it would be fun to have a little spotlight Q&A with her and her husband. They just welcomed their son Hendrix and invited a friend of mine, photographer Adrian Faubel for a newborn photoshoot. Check it all out below! Cheyenne, thanks so much for sharing with me and my readers! Tell us a little bit about yourself and your family! We've been together for five years, married just over two and just welcomed a baby boy into our lives. Each epic moment in our relationship was marked with a different destination — started dating in Austin, got engaged in Montauk, married in San Miguel de Allende, pregnant in either Tahoe or Santa Fe (who really knows?) Travel is a big part of who we are and what we want to foster in our family. Adventure makes you get outside yourself and learn something new. Dallas has always been home to Holden and became home to me in 2006. We live in the heart of the city off Henderson and Lower Greenville. We love the energy and walk-ability of our neighborhood, we also love the eclectic crowd that it attracts. We hope to always be in an urban city as we're anything but home bodies. Modern, but comfortable. We love minimalism, clean lines, bright whites with touches of mid-century modern and southwestern chic. Our home is full of neutral furniture so that the art and textiles can bring life into our space. What drew you to choose the Zen tapestry design? I loved the versatility of it. It's clean with a bold visual that worked well with our black and white Moroccan nursery theme. Then once our son outgrows it we can hang it anywhere within our home and it would vibe with our style. I love that! How did you utilize it in the nursery? It's the focal point of our nursery hanging just above our crib. Elated! It makes for the perfect statement piece. We wanted his room to be zen and less "nursery-like", so having this wall hanging helped give it some maturity. I'm so excited to hear that! Are there any other home projects in your future? We have several! Next up is a big outdoor project, but then we want to focus on having a big open indoor space for entertaining large parties. We want people to feel relaxed when they come over - so lots of natural light, comfortable seating, greenery and thought-provoking art. What a gorgeous family and sweet nursery- Thank you so much to Cheyenne and Holden for sharing these beautiful images with us! 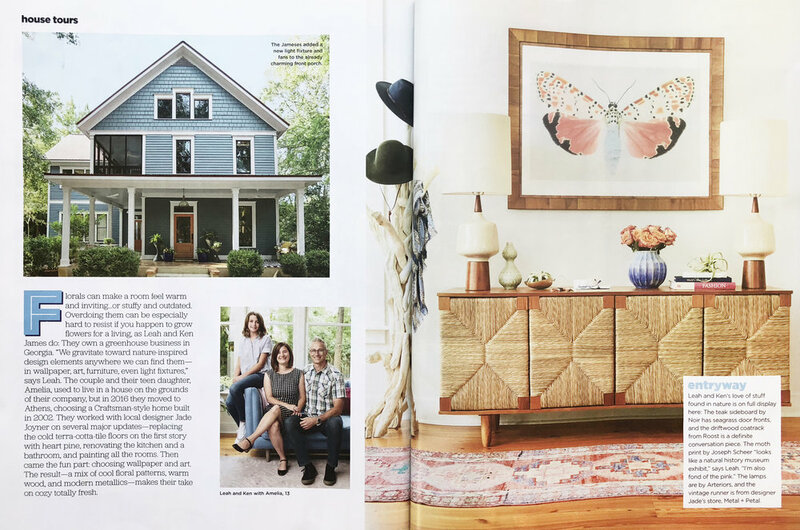 I'm so excited that a tapestry of mine was featured in the Home Tour of the May Issue of HGTV Magazine. 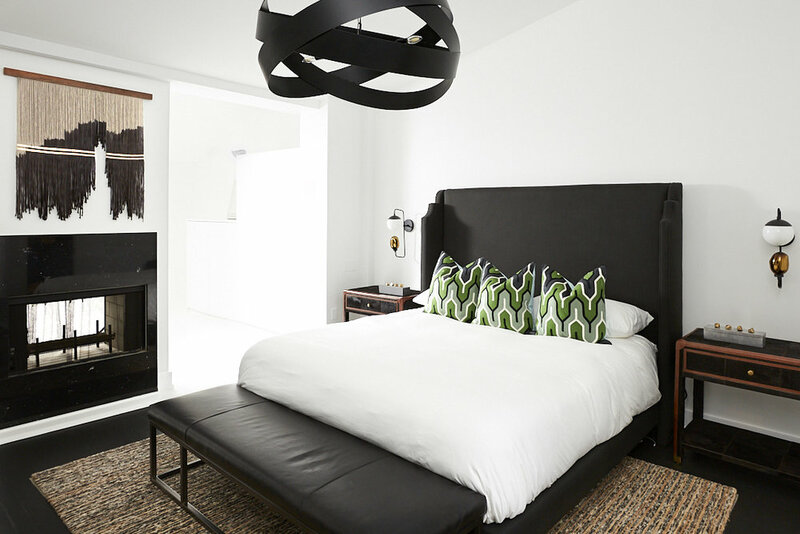 Check it out in the Master Bedroom in the photo below, I love how it pops on the black wall! In my recent cotton knit collaboration Molly Fitzpatrick, creative director of DittoHouse and I saw this as a fun opportunity to blend our seemingly different styles into one. The result is a design that I think captures the richness of my tapestries and achieves visual depth and interest as an expertly knit, American made DittoHouse throw blanket that i'm so excited to share with you for a limited time on the shop! I had such a fun time working with Molly on this project and was excited to host a little Q&A with her about the collab! So how was this idea born? Lauren approached me after finding me on Instagram. She proposed collaborating on a throw blanket design and I was eager to learn more about her and her business. After chatting on the phone we decided it would be really interesting to find a middle ground between our art styles. What did you first fall in love with about Lauren's work? I love that Lauren's work is organic and not only has actual movement in the fibers, but also visual movement in the intensity of dyes. How did both of your unique styles/expertise fit together on this project? Lauren's unique dyed fibers have a distinct look and feel, I enjoyed the challenge of capturing the loose style of her work with the rigid and geometric nature of knit textile; I was excited to capture Lauren's larger than life tapestries in an approachable, everyday textile. How do you describe your own design aesthetic? Both you and Lauren have beautiful homes filled with wonderful families-- how does your idea of 'home' fit into the motivation behind your art/products? I love the idea of filling my noisy, busy home that my husband and I share with our 2 small children with textiles, art and inspiring spots to think and play. I am inspired to create textiles that are not only works of art but functional pieces to warm our home and the homes of my customers. Textiles are such a unique medium with the added sense of touch involved. What role does material choice play in each of your creative processes? Material is very important to me. My choice to use a recycled fiber is intentional, knowing that responsibility in textile manufacturing is incredibly important to the future of our earth. I am able to create lasting, timeless products freely knowing that small batch production with sustainable fibers can be enjoyed for generations. What's one of your favorite things about this new knit throw? 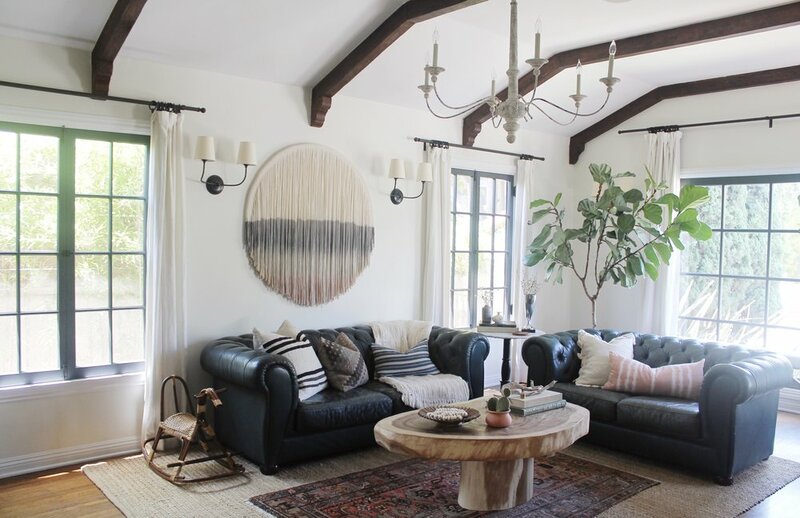 I love that this throw can transition from modern to eclectic to traditional depending on how it is styled. I hope you love the new piece as much as we did! They'll only be available for a limited amount of time so be sure and grab yours below! In a collaboration between DittoHouse and Lauren Williams®, this limited edition recycled cotton knit throw blanket is inspired by Lauren’s one-of-a-kind Canvas With Movement® fiber art. 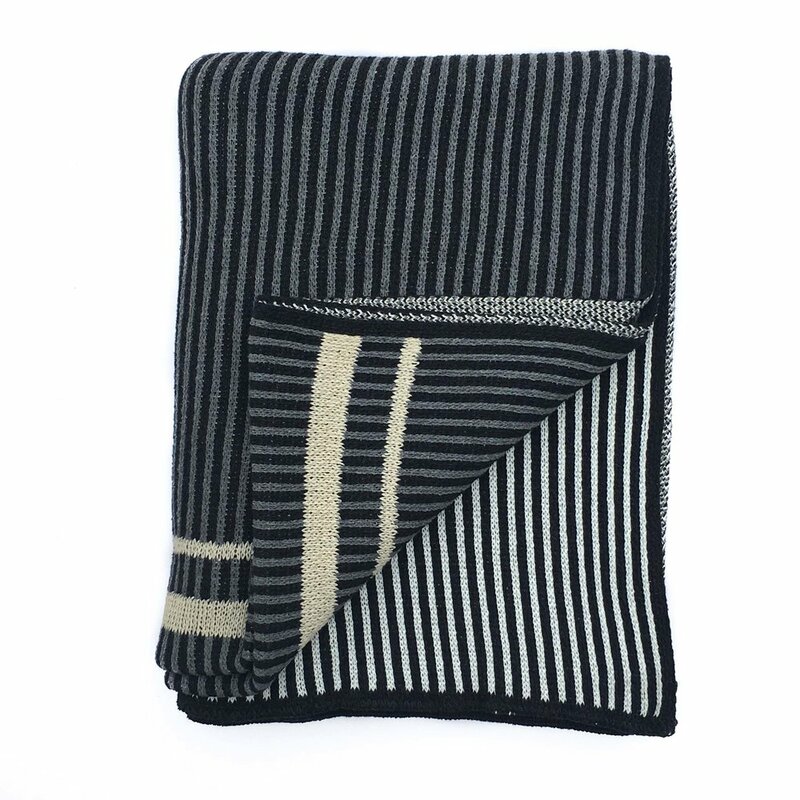 The design is composed of parallel vertical stripes in black, gray and white with two horizontal stripes of a champagne colored yarn. Molly Fitzpatrick, creative director of DittoHouse and artist, Lauren Williams saw this opportunity to blend their seemingly different styles into one. The result is a design that captures the richness of Lauren’s tapestries and achieves visual depth and interest as an expertly knit, American made DittoHouse throw blanket. 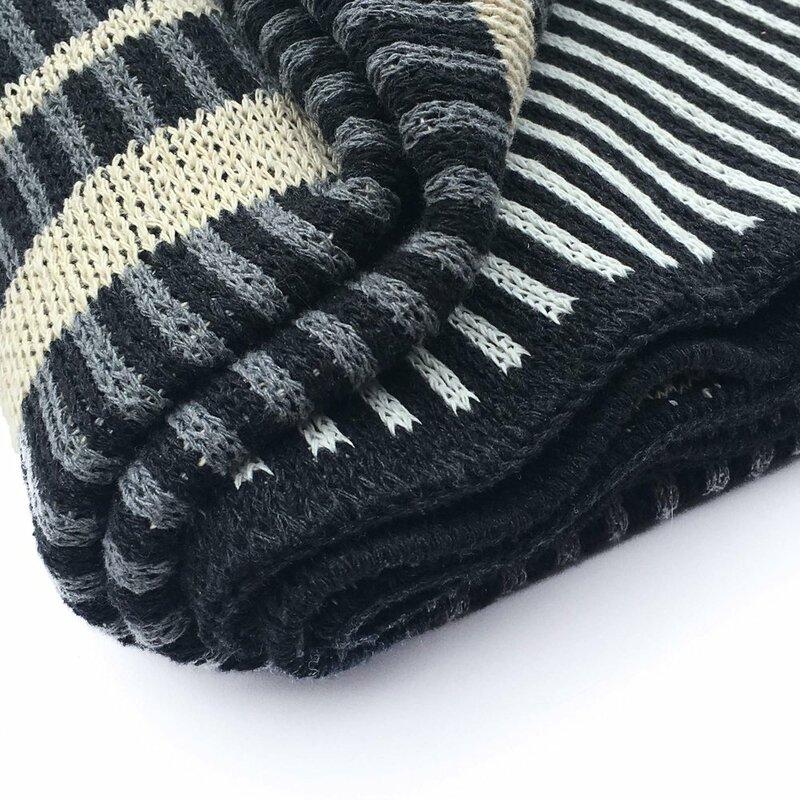 The recycled cotton yarn used in this blanket utilizes pre- and post- consumer textile waste. The waste cotton materials are sorted by color and de-fiberized to be spun into new yarns. Since this ingenious process uses materials which have already been dyed, no new dying is needed to create these yarns! I was so excited to be featured on a recent Podcast with Knit Collage! Check it out below and let me know what you thought! Check out the original article over at Knit Collage here. I sat down with Flea Style's Podcast: Fridays with Flea Market and talked about my story, how I got here, and mastering the balance between being an artist and also having a passion for business. Check out the podcast below! Canvas With Movement is how I described my first fiber art creation once it was dry and hanging on the wall of our rental home, in September of 2014. After making a wall hanging specifically for the large wall in my dining room, I was hooked. But there is so much more to this story. 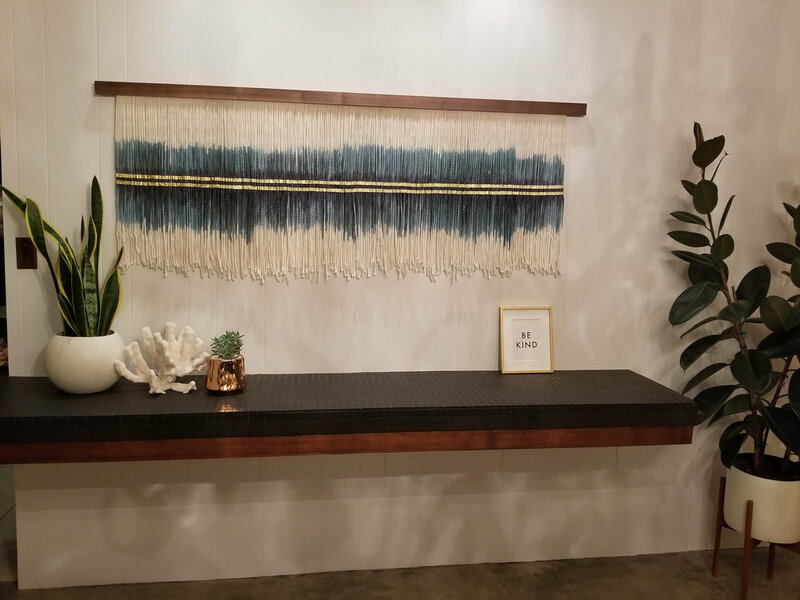 The first piece eventually lead to a new form of fiber art that is finding its way into homes, restaurants and hotels all around the world and it all started with a blank wall. In 2014, our family of four moved into a cute rental house in Dallas, Texas. Big windows let in the best natural light and I knew the original wood floors were going to look stunning once I repainted the pale green walls white. The mature hydrangea bushes and tall trees that filled the lot, provided a very charming place that we would call home, at least the term of our 12-month lease. My husband and I are entrepreneurs, and growing a small business while also growing our family, has had its financial struggles. We moved several times since getting married and I was no stranger to rearranging our hand-me-down furniture and thrifted couches to fit in various apartments and rental homes to create a space that I was proud of. From a Los Angeles apartment to a Dallas rental house, we found ourselves with more space to work with, however two boys under the age of 4 made every square foot of our home very valuable. My visions of decorating each new rental always faded quickly among the piles of dinosaurs, Legos, balls and toy trucks, but the one thing I couldn’t ignore were the empty walls. Because my taste for art and my budget for art didn't really align, I took it upon myself to paint small canvases, incorporate thrift store art and frame photos of our boys to fill any voids. The wide open living room that joined the dining room in our newest rental however, had a wall that was begging for a statement piece. There was a day in September when I walked past the wall and the windows were allowing the best natural light to fill the room and it hit me- I knew exactly what the wall needed. It needed texture. Dimension. Substance. Movement. And it needed to be big. Immediately I had this idea of suspending individual strands of something (Fabric? Strips of material? A Textile?) to a wooden dowel to create a sort of canvas, but with texture, movement and dimension. I spent the next day wandering the aisles of a craft store and then a hardware store for supplies. I came up with something that I couldn’t wait to work on. That Friday, after putting the boys to bed, I stayed up late cutting yarn and attaching each piece to a long wooden dowel. My husband gave me a curious side-eye during the movie we watched as I worked to bring my vision to life. The next morning was warm and the kids played outside while I rested my new “canvas” between two Ikea storage shelves so that I could add color to the hanging strands of yarn. I was familiar with paint, but had never used liquid dyes to create a design. I started simple and added a layer of gray dye, then navy in the center and an aqua green color for the sides. 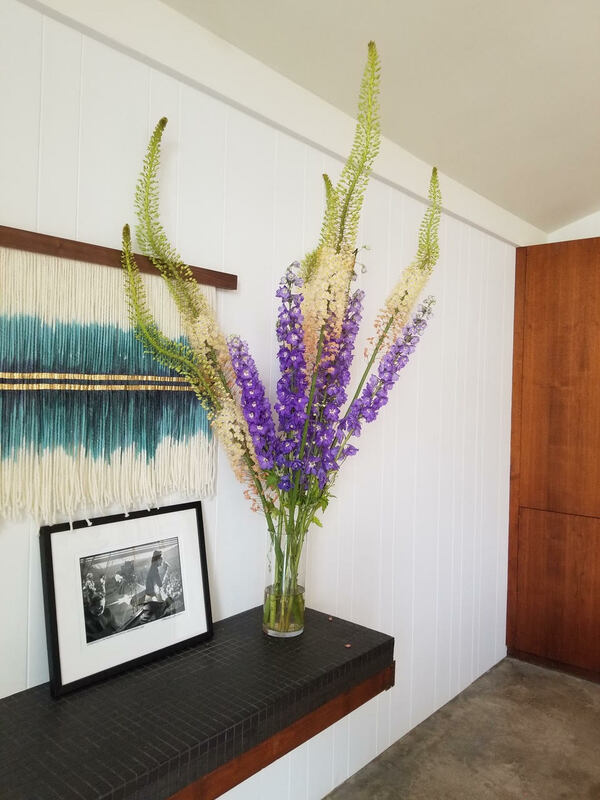 It was windy and the strands were flying everywhere splattering me with dye but once the sun dried the hanging fibers, I brought the piece inside and used thumb tacks to hang it on our dining room wall. I stood back and eyed my creation. It was interesting. It added texture and a unique look to my basic dining room. It felt warm and inviting. I couldn’t stop looking at the way the dye layers faded into each other so effortlessly, creating a peaceful and organic feel. From the wooden dowel at the top, the fibers hung down at various lengths and the line that the strands created at the bottom of the piece was unstructured and so natural. With an overall dimension of 6 feet wide and 4 feet tall, this was a large statement piece that was unlike anything I had ever seen. My husband, an art lover himself, came to see my work and he was intrigued. He was immediately drawn to the movement of the strands as I "combed” my fingers through to untwist groups of strands to lay them flat on the wall. Individually James and I are very particular about our taste and styles, and I knew that if we could agree on a single piece of art, I was on to something. His complements began and he wanted to me to make another one for our bedroom. I was flattered and excited that he appreciated my vision. I felt that this addition to our plain dining room had suddenly opened a door of creativity that was just waiting to be explored. I decided to build another “canvas with movement” piece and thousands of tapestries later I am so grateful for that big, white, plain wall and often find myself searching for more blank walls to be inspired by. Check out my most recent collection of tapestries here!